I didn't. I had a red side and a blue side... same results. No question red is important and that green is wasted.. but red is not the only frequency that works. I accidentally had UV LED on a corner of the overflow and that seemed to have explosive growth. Hi Karim; your red side / blue side set up isn't that at all in reality & cannot be considered useful as an experiment to determin which is the better spectrum for growing algae. Firstly, your red side not only flooded over to the blue side of the screen, the red penetrated through the screen to the algae on the 'blue side'. Secondly, your 'blue side' also had 50% CW LEDs, which have the red spectrum, also shining directly onto that 'blue side'. Salty jo, on the other hand, had two seperate scrubbers, both illuminated on one side only, one using only blue LEDs & the other using only red LEDs. His results would be considered useful. His results showed that the red was much more efficient. Blue & violet light is used by algae to photosynthesise, but people in the know typically will use either one blue, or one violet LED to six red LEDs, & they run the blue or violet LED at half the watts of a red LED, otherwise the blue or violet tends to cause dead spots. Light might be too bright, until the screen fills in more to absorb it. Because there was too much light. Hi Horace; your screen looks to be about 8" by 6", so your 50 Watt fully red spectrum LED light unit would give you a bit over 1W of red spectrum per square inch of screen. The most effective wattage, for fully red LED, is about 0.27 to 0.4 Watts per square inch of screen. So your 50 Watt red light unit was way too much. When the wattage, or intensity is too high this causes photo-saturation, & photosynthesis ceases. No, or little growth. how would you know that? did you see my setup in detail? Did you measure the light on the opposite side? More than a little condescending, bud.. but you're entitled to you views and whatever data you choose to believe to be accurate based on your experiences... please don't presume to judge mine based on no evidence or data. My sheet was ~24" x 36" and with only one side lit up, there was <30 PAR on the other side. Once the algae film started to glow, it dropped to <20 PAR. "Flooding" to the other side? Hardly... Intelligent people can create scenarios that validate their views - don't fall in that trap. people in the know can also be nice to others... I am sharing my experience and you're free to share yours. Unless you have an independent study authored and independently duplicated in scientific journals that shows that ONLY red light matters to algae growth, your data is your experience. I share mine because the efficiency and cost of LEDs matters and these puck lights have been very effective, inexpensive and consume less power than the red LEDs to get the same growth. It could be that the red LEDs I was using were less efficient (PAR to Watts). It could be that the combination of red and blue in the white LEDs provided more light PAR and the pucks were more efficient... Those may be valid counterpoints - but assuming that the red light "flooded" to the other side and grew algae backwards on the screen is just confirmation bias. wow, settle down. I'm just making an observation. No need to be so defensive. You use a clear screen. Light passes through to the other side. So your red side passes through to the blue side. I can see from your photos that the red flooded the other side, & the blue did the same. I saw from your previous posts in this thread your manufacturing of your red & blue LED lights. They both had cool white LEDs mixed in. White LEDs have red. I wasn't un-nice to you, & had no intention of upsetting you. I thought I was being nice. Unless you have an independent study authored and independently duplicated in scientific journals that shows that ONLY red light matters to algae growth, your data is your experience. I posted pictures showing my growth using only RED LEDs. I researched algae scrubbers, particulaly in regards to using LED light, & all the info stated using RED. This debate started when I suggested to Horace that he could have the same success, or better, using a lot less watts. By using only red LEDs. He is using a lot of electricity to generate watts for light spectrums that are usless for photosynthesis, & growing algae. I didn't ever suggest his light wouldn't work. Take a deep breath bro & relax. We can agree on this... green light is a waste. Red light is very photosynthetic. We don't agree on this... I think blue and UV is also very photosynthetic based on my results. Check out figures 7 and 8. There's leakage through the translucent screen- but very little and quickly covered up. The while LEDs do have red, but I used cool white, so more blue than red... and I used them on both sides, so should have been net neutral in the algae. When I researched the same, I found that the white pucks are substantially cheaper on a Watts basis vs. the red hydroponic single LED matrix lights. This is because those hydroponic lights are branded as "100 W equivalent light" but were really 30-40W or less. The white flood lights were for general population use and not specialty. They were really 100W (verified with both PAR and Watt meters). It's not usual that I buy instead of DIY but the cost benefit was too high. Would it have been "better" to get a light that's just blue and red for maximum photosynthetic efficiency? Yes- a little... but the extra light fixture cost (especially on the real 500W scale I run at) would have been much more without a break even for years. I don't think the hydroponic lights would last that long anyway... so the most $ efficient solution I found was the white pucks. It is technically possible to replace the pucks with red and blue pucks but the voltage they run at is different and I'm too lazy and busy right now for that DIY... and I've switched to solar for my own setup. There is actually debate about the role of green in the photosynthesis process. Some think it has something to do with a triggering of the light/dark cycle switchover or some other kind of integral part of the general photosynthetic process. But the absence of it for algae scrubbers for the most part does not seem to matter, so I don't know how much of a difference it actually makes. Floyd, upped my lights to about 12 hours and cleaned my screen after 14 days. Previously I Justin peeled the algae off like a sheet of paper, but with more light and shorter cleaning periods the algae is still strongly attached to the screen. Huge difference. For algae scrubbers, the absence of green light make no difference at all. Obviously. We could discuss the role of yellow light & its necessity for ripening fruit on the vines of terrestrial plants. But we're not. What we are discussing here is simply growing marine green macro algae on a plastic mesh screen. Not red, brown, purple, or any other color. Just green. For this purpose, Quote - "Here’s the bottom line: you only need RED. Nothing else is really necessary. White LEDs of any kind have not proven to be highly effective, and neither are Blues (with the exception that they accompany reds in a low ratio)." This is certainly what I have found to be true. Violets have superceeded blues, but they are not necessary. People have done the experimenting & I have no intention, & see no usefulness, in investigating further. I'm not interested in re-inventing the wheel, & the basics of simply growing green marine macro algae on a plastic screen doesn't need me to continue doing experiments that have already been done. Further - "The best results so far have utilized 660nm “Deep Red” LEDs; there have been far fewer attempts using 630nm Red LEDs. These wavelengths roughly correspond with the Chlorophyll A and B red peaks. Optionally, some 455nm Royal Blue LEDs can be thrown in; according to horticulturalists, and one study by NASA, this ratio is approximately 7:1 red: blue." "One Algae Scrubber user, who has made multiple LED Algae Scrubbers over the past couple years, commented that the use of only 660nm produced great growth, but with the addition of a single blue LED, that growth got ‘stronger’. The algae was more difficult to scrape from the screen, and the strands were more stringy or ribbon-like, and less hair-like. This anecdotal evidence suggests that the blue component is used supplementally in some fashion. So a little blue can’t hurt; add too many and you’re probably just wasting power." I've used just red, & I've used red/blue. I found no advantage in using blue. The growth was not faster; the attachment was not stronger, & using only red produced a species of ulva on the screen, naturally, which is ideal for scrubbers. In fact, I've seen an advantage of using only red over red/blue. I haven't used violet in combination with red, so cannot say if growth was faster as reported by some. But I don't need or want faster growth. Your views are certainly your own. No one is expecting investigation as long as you're clear that this is your experience and not absolute fact. Interestingly, I'm not interested in just green algae. I've always believed in deversity and that extends to everything living. I actually find that the different algae strains in competition create a more interesting and robust algae mass. I kept hearing to use red 660. I looked at the photosynthetic graph and had to believe that blue 450 would also grow algae like mad. I tried to get good info online but kept running into paywalls. I kinda expected to grow two kinds of algae with both of them growing like crazy. Given that red worked so much better for me suggests the algae that works best for scrubbing are typically found in shallow water. Absolute fact? I believe that something is either factual, or not factual. I use just red 660nm LEDs at a specific wattage, as recommended, & have done so for some time now. And the fact is, that grows very good green thick algae on a plastic screen. No other LED colors, very low wattage. That was my original point to Horace - that he could use a lot less Watts & get the same of better results. The bold statementsin my previous post are the finding from Bud Turbo of Turbo'sAquatics. Copy & pasted from his forum. This is a guy with extensive experience in regards to algae scrubbers, & a guy who has conversed extensively with many other scrubber users, for a long time. Their findings, their views (including NASA), not just mine as you put it. If you want to argue their finding, you'll need to set up a proper experiment. Look to salty jo for advice on that. In regards to growing algae, purely as a means of nutrient export, a variety of algaes is not necessary. All that is needed for this is one algae, that grows reasonable fast & thick, over a period of 7 to 14 days. That will remove all the nutrients needed. Last edited by Twinfallz; 12/17/2017 at 07:04 PM. Yes, I believe this is what the majority have found. I still use CFLs on mine because i could not get good growth with my red 660/630 mix and a few blues thrown in. Probably a user error of too much power or too long period, but after messing with it a while i had enough and went to a simpler setup. I do wonder if some of the IR is also useful, as has been said for corals in general too... (running MH again myself as well). I first used fluros on a horizontal scrubber I built back in the 1990's. 3,000 - 4,000 k. Some very interesting & unusual things grew. the algae that works best for scrubbing are typically found in shallow water. Yes that is true. The stuff that attaches to rock and get splashed by waves (air/water interface) gets tons of red from the sun. Deeper down, and browns grow, but get no red light. Dynamic Aquaria by Adey covers this. there were no signs of photosaturation at all. The sign of photosaturation (too much of the correct spectrum of light) is zero, or little growth, just as you experienced. Too higher wattage is worse than not enough. Regardless the red led fixtures cost 2x as much and they didn't work nearly as well. Based on the photo of your previous light fixture, Post #9785 http://www.reefcentral.com/forums/showpost.php?p=25275796&postcount=9785 the specs are - 50 Watts total, made up of 40 red spectrum LEDs, wavelength: 650-660nm & 10 blue spectrum LEDs, wavelength - 440-450nm. That’s a red to blue ratio of 4:1, & that’s a problem to begin with. Those lights are supposedly designed for flowers, vegetables, terrestrial plants. Too much blue is not only a waste for growing green algae in a scrubber & not necessary at all in fact, too much blue has been reported to cause dead spots. When used at all by scrubber manufactures a red / blue ratio of 12:1 is recommended when measured by wattage. This 4:1 ratio would have negatively affected your growth especially considering the wattage of the blues which would have been extreme for the size of your screen. In regards to the reds, based on an output of 40 watts that would be approximately 0.8 watts per square inch of screen. The recommendation is around 0.25 watts to 0.5 watts per square inch of screen. 0.8 watts,,, way too much. I wouldn't expect that light fixture to perform well regardless of the screen size. It seems you bought a light fixture not suitable for the purpose, & I imagine based on its physical size for light spread, not on the correct wattage. The correct wattage for the screen size in your scrubber, using just red 660nm spectrum light would be around 16 watts per side. While your 50W white led lights will work your costs include running 100 watts of white light when only around a third of that wattage, in just red 660nm, is necessary to get the same or better growth. As I suggested previously your present LED lights are warm white & include all the spectrums of light. Its producing red light but the other spectrums its producing are either a complete waste in regards to photosynthesis & growing algae, or are unnecessary for this purpose. I thought yellowing algae was more an indication of the scrubbers illumination period being too long for a given level of nutrients in the water? Especially a lack of Fe ? Dana Riddle has shown that photosynthesis shuts down in species of corals such as Porities, found in shallow tidal pools, when par levels reach a certain intensity during the day as the sun is on it way to approching it highest point in the sky. 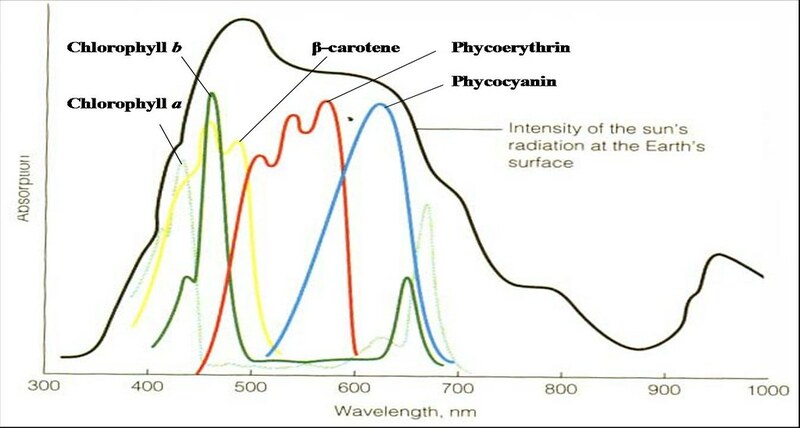 He refers to this as Photo-inhibition as opposed to Photo-saturation which is the level of light intensity where the rate of photosynthesis has reached it's peak. Figure 3. …the method described in the text defines the onset of Photosynthetic Saturation. (or about 20,000 lux). Using a similar method, onset of Photoinhibition would be about 700 µmol·m²·sec (or about 35,000 lux). It's too little iron etc, in proportion to how many nutrients there are. Photosaturation is a moving target, based on nutrients available.